Mrs. Emil Forehand was my Fifth Grade teacher. She was a good teacher but strict. Some students called her �Ms. Four Eyes�. She had an uncanny ability to identify a misbehaving student in class as she was facing and writing on the blackboard. ��. 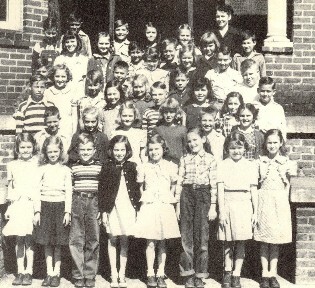 In my grammar and middle school era at Watkinsville, we had a little building (1-4 grades) and the big building (5-11). The restrooms were in the basement of the Big Building. The lunchroom building was just north of the Big Building. The VO-AG building was located on the northerly edge of the campus where Agriculture and Home Economics was taught for High School students. Mrs. Booth’s chemistry lab and ninth grade homeroom was located in the house at the corner of the ball-field, fronting on Third St. The building had previously served as the office for Dr. McGarity who was a Watkinsville doctor during the 40s and early 50s. Mrs. Booth had taught the 10th grade when I was in the Little Building. 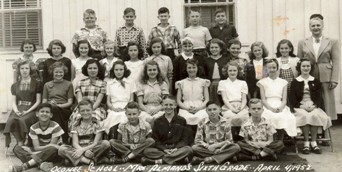 Helen Booth taught 10th grade homeroom in 1949-50 at Watkinsville. I was in the Little Building then. 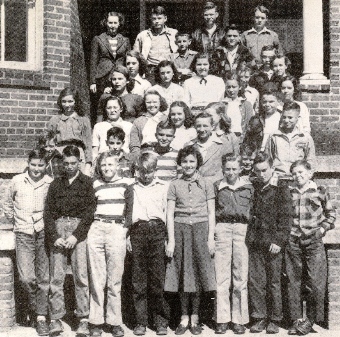 After the fourth grade, we Fifth graders went to class in the Big Building – where the High School Classes were held. Mrs. Emil Forehand was my Fifth Grade teacher. She was a good teacher but strict. Some students called her “Ms. Four Eyes”. She had an uncanny ability to identify a misbehaving student in class as she was facing and writing on the blackboard. I have never understood if she managed to see a reflection or just sensed from sound and location. She taught for many years and lived in downtown Watkinsville. Mrs. Mary Almand was the sixth grade teacher and taught for many years at Watkinsville. Many of us had started first grade together and continued to be in the same home room. In that class we learned more about world history and geography and health. 5h row: Ms. Almand, Delores Montgomery, James Daniel, Tommy Thomas, Charles Hayes. 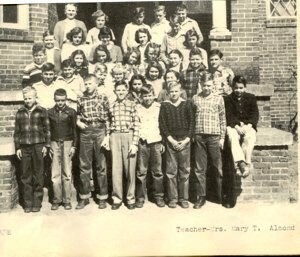 In the Seventh grade in 1953, we had a young pretty teacher named Kay Guthrie. Her husband was a Lieutenant in the Military and she was anxious about that during the Korean War. I remember the day she took all of the boys to the Office and explained how girls were now different and we had to be aware of that. She was pretty but strict. Once she caught some boys, including yours truly, leaning out of the second story window of the class room and tossing water filled balloons onto the sidewalk. It was really fun until we started to toss one and looked down and saw Mrs. Guthrie looking up at us, and in an angry voice demanded to know what we were doing. We stopped that. She had a large paddle and used it on occasion. I cannot remember ever being paddled by her but one’s memory does fade over time! I do not have a picture of Ms. Guthrie from the Seventh grade. She and her husband retired and located at Lake Oconee a few years ago. 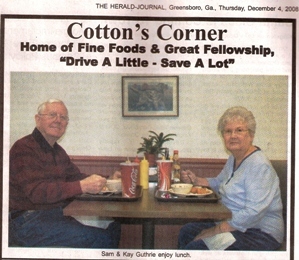 On December 24, 2008, they were featured as guests at Cotton’s Corner restaurant in the Herald-Journal in Greensboro.